Molecular Gastronomy is a science that investigates the chemical and physical changes that occur when particular ingredients are being cooked. The following information describes what molecular gastronomy is, some basic techniques and ingredients used in the process, and a few of the dishes in which this is utilized. Nicholas Kurti, an Oxford physicist, and Herve This, a French chemist, are credited with coming up with the term molecular gastronomy. 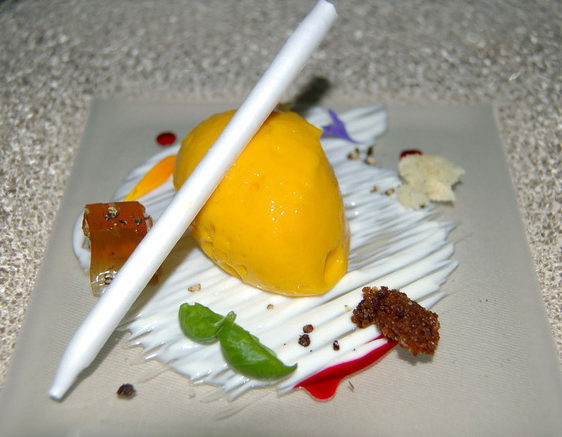 Modern molecular gastronomy is often considered to consist of three elements. These include technical, social, and artistic components. This type of cooking and working with food has several different styles and has been called by a variety of names. A few titles for this type of cooking include culinary constructivism and emotional cuisine. Some of the specific techniques include the following. Flash Frozen – This method freezes food almost instantly when using liquid nitrogen. Fruits and veggies are frozen without damaging their membranes. When the food is defrosted the same texture is thus maintained. Edible Paper – Consisting of soybeans and potato starch, this method produces edible paper that often has fruit ink in it. Deconstructed – This technique involves taking apart flavors of the food so they can be enjoyed individually when eating an item. Sous-Vide – Food is cooked in an airtight bag that has been submerged in temperature controlled water. This is often done with meat or vegetables. Foam – Using thickening agents and stabilizers food can be turned into a type of foam. Meringue is a foam that has been around for a long time. This method is now being used with fruits, vegetables, and even cheeses. Making the dishes described above require certain types of tools and ingredients. The following are some of the items used when making incredible molecular gastronomy creations. Liquid Nitrogen – It is used as a coolant and is never ingested. Food Dehydrator – This reduces the moisture content in food. Vacuum Machine – This is often used in sous vide cooking. Syringe – A syringe is for inserting and adding all sorts of delicate ingredients into various food creations. Ingredients often include sugar substitutes, gelling agents, stabilizers (such as gum arabic), carbon dioxide, and emulsifiers (such as xanthan gum). Food experiments involving molecular gastronomy have brought forth many interesting and innovative dishes. A few specific dishes include faux caviar, crab ice cream, and hot gelatin. Spherification of everything from juices to green tea are also popular dishes in the field of molecular gastronomy. The field of molecular gastronomy is likely only beginning. The possibilities for new and creative types of recipes are almost endless. The future of cooking and dining is increasingly being transformed into an incredible sensory experience. Be the first to comment on "What is Molecular Gastronomy?"